The problem with CRA. Since its inception, create-react-app is a great tool for rapidly prototyping React apps, demos and testing different features or techniques.... 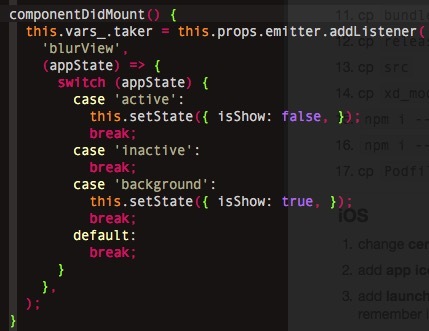 Here is what I (unexperienced react padawan) was thinking: Properties are immutable, state is mutable therefore if I change the properties of a component react will figure out it is a new component, create it and call getInitialState. Alternatives to Controlled Components. It can sometimes be tedious to use controlled components, because you need to write an event handler for every way your data can change and pipe all of the input state through a React component.... React has no way of knowing that the data didn’t change. Therefore, React needs to call componentWillReceiveProps , because the component needs to be notified of the new props (even if the new props happen to be the same as the old props). For values for which a change should trigger a re-render, you should use local state or props/Redux store. Use cases The use case for this is to store values for which a change …... Here is what I (unexperienced react padawan) was thinking: Properties are immutable, state is mutable therefore if I change the properties of a component react will figure out it is a new component, create it and call getInitialState. The react docs mention that if you change a component's state during componentWillMount, render will only be called once (with the updated state). With that in mind, I'm guessing the issue is actually that redux is updating the props , which react doesn't expect to happen in componentWillMount .